BaNES Communities, Transport, and Environment Scrutiny panel have set up a Task and Finish group to investigate Adam Reynolds’ Day Parking Zone proposal. This proposes setting up Resident Friendly Day Parking Zones across the WHOLE of the city to tackle air pollution and congestion, generating much needed revenue for the council, enabling investment in public transport, walking, and cycling. No city in the world has considered such a radical approach before however if we really want to tackle air pollution within a climate of austerity and get more people out of cars, then proposals such as Day Parking Zones need serious consideration. 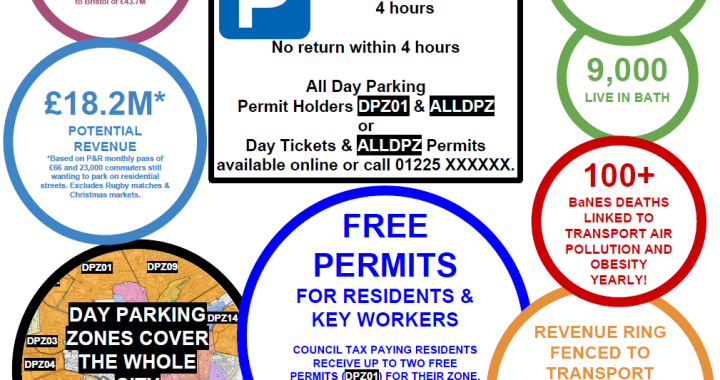 The aim of Adam’s proposal is to reduce remove free ‘day’ parking from the whole of Bath city, to reduce car drivers incentives to drive within Bath, and to persuade them to make better use of public transport, cycling and walking. This article on CycleBath’s website clearly describes to proposal and the reasons for considering it; the aim is to reduce congestion, air pollution and to persuade people to use healthier modes of transport.